On average, small business owners can expect to pay around $80.75 per month for Public Liability insurance. Public Liability Insurance is one of the most popular types of insurance for businesses. In fact, it is essential for almost every kind of business from those that operate in the trades and service industries, to businesses that are predominantly office based, such as consultancy occupations. Other factors that may play a part in determining the cost of your Public Liability policy are the location your business; what is included and excluded in your policy; and the insurance provider you choose. We have put together a snapshot of how much Public Liability insurance can cost for a small business, by analysing data from BizCover policies sold during the 2016/17 financial year. The sample we analysed includes more than 16,000 businesses across many different occupations, which have 10 or fewer employees. However, the most accurate way to find out the cost for your business is to simply get an instant online quote. What is the average monthly premium for Public Liability insurance? On average, small business owners can expect to pay around $80.75 per month for Public Liability insurance. From our analysis, we have found that around 32% of small businesses pay less than $50 per month; while around 50% pay around $51-100 per month for their Public Liability insurance. What is the average cost of Public Liability insurance by industry? One of the biggest factors influencing the cost of Public Liability insurance is the type of industry your business operates in, and the nature of your occupation. The higher the risk of your business potentially causing personal injury or property damage, the higher the premium, and vice versa. For example, cafes and restaurants present a higher risk due to a combination of dozens of people passing through the doors each day, and the number of things that could potentially go wrong which could lead to a claim being made. For instance, food poisoning; slips and falls on wet floors; and scalds caused by hot liquids. Meanwhile, an office-based business, such as an accounting firm or marketing agency, is considered less risky as there is generally less foot traffic moving through the premises, and their work is less likely to cause injury or property damage to clients or members of the public. It is important to note that each insurance company assesses risk in different ways. What one insurer may consider as a high risk occupation may not be considered risky by the next. This is partly due to the number of claims each insurance company has received for each given occupation. As you can see, businesses that operate in the wholesale, retail and manufacturing industry have highest base premium, which is predominantly due to them being liable for injury or property damage that may be caused by the products they manufacture or sell under the liability provisions of the Australian Consumer Law. How much do Tradesmen pay for Public Liability Insurance? There are many different types of occupations that operate within the Trades & Services industry, each with a different level of risk, which means the premiums can vary greatly from one trade based occupation to another. 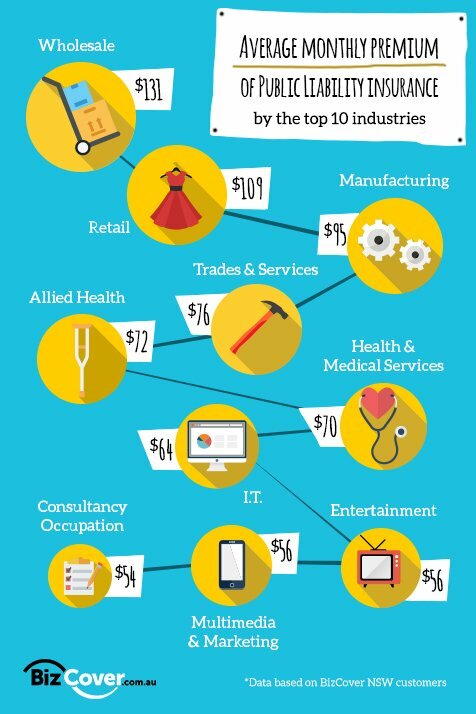 We have analysed our top 10 most popular trades and services occupations. You can see from our results below that commercial cleaning businesses is one of the occupation with a high average premium. Whilst commercial cleaning may not sound like a dangerous profession, they are considered particularly risky by insurers as they are often required to clean office buildings and public spaces, such as shopping centres, during opening hours which puts them at greater risk of causing bodily injury to somebody. Consider what could go wrong when wet floors, vacuum cleaner leads and hazardous chemicals are mixed with members of the public. Does the size of my business affect the premium? The number of employees and the amount of revenue your business turns over can have an impact on the cost of your Public Liability policy. Unfortunately, the old ‘safety in numbers’ principle doesn’t apply when it comes to insuring your business. In fact, the higher the number of employees you have means there are more people in your organisation who could potentially cause an accident such as bodily injury to a customer or member of the public, or damage to a third party’s property. For example, you own a real estate agency which has grown from having just 3 employees to 10 employees. You now have 10 agents going out visiting multiple properties each per day resulting in a higher chance that that something could go wrong. Generally speaking, insurers will look at the number of employees when determining the cost of Public Liability insurance for trade and service based businesses, whereas revenue plays a more important role when it comes to pricing for office based businesses. ABS statistics from 2016 shows that sole traders make up of 60% of total businesses in Australia, that is more than 1.3 million businesses^. As sole traders are considered lower risks compare to businesses with employees, they only pay around $67 per month for their PL policy according to our data. Does the level of cover affect the premium? As with most things in life, the more you buy of a particular product or service, the more it will cost. When it comes to Public Liability insurance however, the cost does not rise too significantly with an increase in the amount of coverage. Fortunately, double the amount of cover does not mean double the premium. The most popular level of cover amongst our customer base for Public Liability insurance is $10 million. However, some businesses prefer to take $5 million, whereas others take as high as $20 million. The amount of cover you elect to take can be influenced by a number of things, such as the type of risks your business is exposed to, as well as any work contracts you take on and / or industry based requirements. From our analysis, the difference in coverage level results in a change of monthly premium from around $12 to $22. What is the average monthly cost of Public Liability insurance by level of cover? How does the location of my business affect my premium? The location of your business will have a slight effect on the cost of your Public Liability policy, as each Australian state and territory charge varying levels of stamp duty on insurance premiums ranging from 0% to 11%. Therefore, depending on which state you are based in the stamp duty will be charged accordingly. If you have multiple offices throughout Australia the rate of stamp duty you pay will be determined by the state in which your head office is located. According to our data, businesses in NSW pay the highest average base premium for Public Liability insurance. However, this is most likely due to a combination of a greater sample size in NSW, compared to all other states, with a higher proportion of business that operate in industries with a higher perceived risk. What is the average cost of Public Liability insurance by state or territory?